I can't believe I've never done a post about anthropologie window displays - they are truly an inspiration! It seems like the creatives at anthropologie are always innovating, coming up with beautiful, organic, and unique displays. Seriously, if you ever need inspiration for ideas for decorating a party or even your wedding, look through anthropologie store displays! Here's just a few photos from the many many that can be found on google + flickr. The egg carton one is unbelievable!! I love Anthropolgie. That store is my absolute favorite!! I love the book wall display too!! anthro does have the best windows. i love how they make beautiful pieces out of everyday items like cupcake liners & egg cartons. walking into anthro is like walking into my grandmother's house. i love it. but i do not love the prices! They seriously have the most creative people working for them. I love it! And I love how different they all are...amazing! i love their windows too! I never really buy anything in the store, but I go frequently to look and get inspired. Like...HOW do they think of this stuff????? So phenomenally creative! I love it! Thanks for including my eggs carton photo!!! OOOOH! 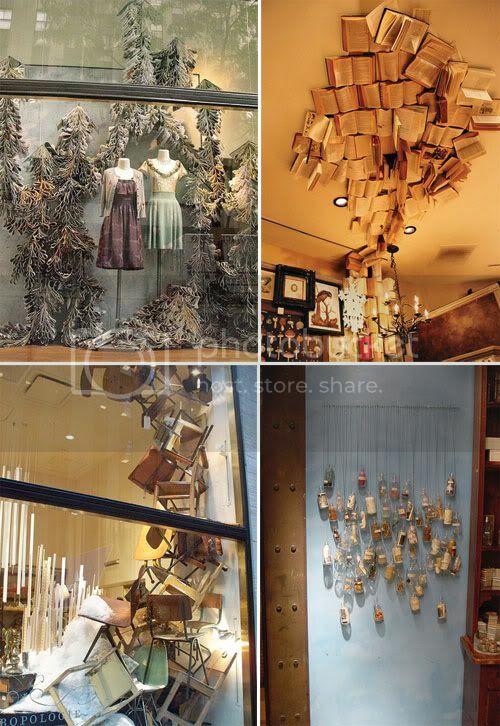 My dream job, merchandising/ design at Anthropologie. I love their window displays especially at the holidays. The paper chain display is my favorite one here.. Absolutely gorgeous displays full of whimsy and character!! Love all your picks!! Im always amazed by how talented they are! anthro is SO inspiring! i love going there just to eat up some inspiration. :) id love to have that job to decorate the place! What a great round up! As Im sure you know Anthro is a constant source of inspiration to me! Thanks for linking back to my page. Great Post!!! great post, I like the mix of patterns and shapes! Aren't they awesome! I've often wondered how in the world they come up with this stuff. Very creative. Gorgoeous! Anthropologie gets my heart beating so fast with their awesomeness. Have you seen their new "commercials" online? Swoon! i am constantly in awe at anthro's displays and the entire aesthetic of the store. i could wander and stare for hours. and i always leave feeling so inspired and creative! honestly... i would probably live in anthropologie if i could. ;) haha! These are SO amazingly creative! I love the one with all the ornaments in boxes in particular. The Anthropologie people are the most creative out there! Their displays are always so original and oh so pretty!! I remember these big display windows they used in the old fashion deptmaent store downtown St. Louis in the 1960's and early seventies. We loved seeing what would be set up next and Christmas time downtown in the evening with all the lights and movements in the shop windows. It was a tradition. These are all stunning! There are some crazy talented people over at Anthropology...from displays, to product selection, to store design...seriously creative! Thanks for sharing Danni! I really love their Window Art i can say they are all unique and fun , really amazing designs..